Apache Tears are small roundish nodules of black volcanic glass known as "obsidian". They look opaque in the image above but when polished most of them will be translucent to semi-transparent if you hold them up to the light. They make beautiful jet black tumbled stones. You can see a photo of Apache Tears that we tumbled below. We also have polished Apache Tears for sale here. The rough Apache Tears for sale here range in size from approximately 1/4" (6 mm) to 1 1/2"" (38 mm) in diameter. Lots of people say that Apache Tears, various types of obsidian, and other natural glasses are a challenge to polish. The problem that they encounter is brusing and chipping if the tears are tossed around too vigorously in a rotary tumbler. That problem is easy to solve! Apache Tears are transparent obsidian. In this photo and you can see colored light in some of their their shadows and even see through some of the stones. 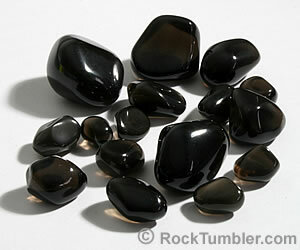 Only a few varieties of obsidian are transparent. These pieces of Apache Tears are about 1/4 to 1 1/2 inches in size and have a Mohs hardness of about 5.5. That is softer than most types of rocks that are processed in a rock tumbler. Obsidian also bruises easily if it is not cushioned. To accommodate these properties we do three things: 1) skip the coarse grit step; 2) tumble for a shorter amount of time in add plenty of media for cushioning. 1) Skip Coarse Grit: Coarse grit will quickly reduce the size of Apache Tears. So we skip the coarse grit step and begin our tumbling with medium grit (150/220 mesh). 2) Less Time: We also shorten the tumbling time in the first step. Instead of two weeks in 150/220 grit, we reduce that to 4 to 6 days. We also reduce the time in fine grit (500 mesh) to 5 days. Polishing time is not changed. 3) Media Needed: Apache Tears bruises easily. To prevent bruising it should be swimming in a sea of small ceramic cylinder media We use about 50% ceramic cylinder media and 50% obsidian. The cylindrical shape of the ceramic media will enable them to act like roller bearings and provide a smooth tumbling action in the barrel. The many small pieces of media will also reduce the impact forces that occur in the barrel and deliver grit to all surfaces of the rough. Apache Tears is extremely "soft" so you do NOT need to use coarse grit. Two tablespoons medium grit (150/220) per pound of rock and ceramic media. Add enough water to barely cover the rocks. You want 50-60% media and 40-50% apache tears. Let this tumble for 4-6 days. Rinse, clean and inspect the material. Tumble longer if more smoothing and shaping is desired. If more media is needed to maintain barrel capacity, that media should be broken in and not new media with rough edges. Again, two tablespoons of fine grit (500F) per pound of rock and ceramic media. Add water to below the top of the rocks. Tumble for five days. IMPORTANT: Make sure that your barrel and rough have been cleaned thoroughly. Any grit carried over from a previous step will likely ruin your polish. Do not add more media at this point. Measure two tablespoons of TXP Polish per pound of rock and ceramic media. Fill with water to just below the top of the rocks. Tumble for seven days. Obsidian is a fragile material the can easily be bruised or chipped. It is recommended that you use a minimum of 50% ceramic media. The use of this media will aid in the tumbling action in the barrel and help deliver grit to all surfaces of the rough. Also the more media, the better the cushioning. Check the bowl every 8-12 hours to ensure the action is still good. If the action has slowed, add water a little at a time until the action is back to normal. If the mud gets too thick you will need to do a complete rinse of the material and bowl. After rinsing, add fresh grit and water and start tumbling again. You are done with medium grit when you are satisfied with the shape and smoothness of the stones. Usually 2-3 days for us with this material. Give the material and bowl a thorough cleaning before moving on to fine grit. Place your material back in the tumbler bowl, then add enough polished ceramic media to bring the load up to the manufacturer's recommended operating level. This will also get you near the recommended 50% ceramic media. Add one tablespoon of grit for every two pounds of material in the bowl. Then, turn the tumbler on and slowly add water until the material has a thin coat of wet grit and the tumbling action is smooth and fast in the bowl. Place the cleaned material back in the bowl. If needed, add ceramic media that has been previously polished, to bring the bowl up to the manufacturer's recommended operating level. Add one tablespoon of grit for every two pounds of material in the bowl. Turn on the tumbler and slowly add water. Stop adding water when the material has a thin coat of wet polish and the tumbling action is smooth and rapid. This photo is of a batch of Apache Tears that we polished. Look at that bright polish and no brusing! If you don't want to tumble this Apache Tears yourself, we usually have medium size (5/8" to 1") tumbled stones of this material for sale. You can find them here.